Fundrise has brought a tech startup’s sensibility to the real estate investing world. These days, there are plenty of ways to diversify your portfolio by adding real estate investments. You can invest directly in real estate, of course, buying properties yourself. You can also invest in publicly traded real estate investment trusts (REITs) through REIT mutual funds and REIT ETFs. There are non-publicly traded REITs sold by broker-dealers, sometimes with upfront fees as high as 15%. Then there are real estate crowdfunding sites that let you browse individual projects to invest in. Fundrise’s eREIT™ approach falls into a different category, while offering relatively low barriers to entry for those who want to invest in real estate. The principle is simple: the condos, office buildings, retail spaces and hotels that make up the properties in Fundrise’s eREITs™ earn investors money as they appreciate and as tenants pay rent. But unlike real estate crowdfunding platforms, Fundrise doesn’t have its users pick individual projects to invest in. Instead, investors pick one or more eREIT™, each of which is a mix of projects. Depending on how active and in-control you want to be when it comes to your real estate investments, this could be a pro or a con. But it can provide a nice balance of diversification and transparency. It’s important to remember that past returns are no guarantee of future performance. That being said, this company's performance so far has been enough to tempt thousands of investors and catch the eye of the financial press. Fundrise has estimated that, assuming an investor made a $5,000 investment in the Fundrise Real Estate Investment Trust, LLC ("Income eREIT™") and a $5,000 investment in the Fundrise Equity REIT, LLC ("Growth eREIT™"), he or she would have received an annualized dividend of 6.95% for 2016. “Our partners were bankrupt, our partners were in shambles,” he told SmartAsset during a phone interview, referring to the Wall Street partners dominating real estate investing. Miller thought “there’s got to be another way to raise money than through Wall Street-type partners.” He came up with the idea of raising the money for urban real estate investments on the internet, and the rest is history. Pricing: How Much Does Fundrise Cost? From now until the end of 2017 Fundrise won’t charge any asset management fees (usually 1%) for a fund that underperforms 15% returns. Each eREIT™ comes with its own fees, though, which can be reviewed in the Offering Circular for each eREIT™. These fees are generally between 0 and 1%. So how does its fee structure compare to competitors’ fees? Miller, the company's CEO, says that because its product is unique, it's hard to compare the company's fee structure to that of other companies, like Vanguard and Betterment. To make its real estate ETFs, Vanguard buys assets from real estate companies which in turn have bought or developed assets (apartment buildings, etc.) and taken them public. Other companies often repackage the real estate ETFs that Vanguard has already packaged, adding their own fees on top. The number of eREITs™ available on the company's website at any given time isn’t huge. In part, that’s because Fundrise is strict with its vetting. According to Fundrise, fewer than 2% of the 2,000+ real estate investment projects the company’s experts reviewed meet the company's standards. The real estate expertise that goes into packaging the Fundrise eREITs™ is one compelling feature of the company. Another point in Fundrise’s favor is its performance record. The company has under management real estate worth over a billion dollars. You can browse through past projects and consistently see double-digit annualized returns. Of course, that’s no guarantee that future projects will deliver comparable returns, but it can be an encouraging sign to potential investors. The fees on the Fundrise eREITs™ vary. Some eREITs™ are structured to provide income while others are geared toward growth. Across the board, though, fees on the Fundrise eREITs™ are low because of the way the company has structured its offerings. With those compelling selling points, it’s no surprise that the company has some big-ticket investors, including Guggenheim and Renren. Fundrise investing is open to anyone with at least $500 – you don’t have to be an accredited investor. 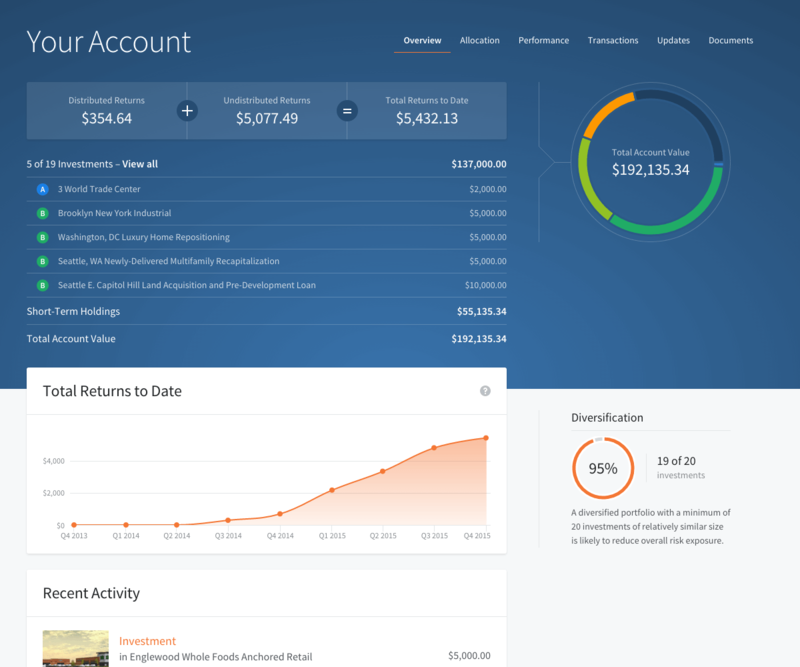 Fundrise offers a Starter Portfolio that requires a minimum investment of $500. However, the company's advanced plans, which offer more options for diversification and personal tailoring, require a minimum investment of $1,000. Still, CEO Miller admits it isn’t for everyone. “If you only have $5,000 or $10,000 saved we’re not a good fit because you need your money to be liquid, you need to be able to sell your stocks tomorrow to pay an unexpected bill. But if you’ve saved some real money and you’re thinking about the long-term, that mass affluent customer is our core client,” he told SmartAsset. For its target customers, Fundrise advocates the Yale Endowment Model, which recommends that 20% of an investment portfolio should be in alternative investments like real estate, as a complement to stocks and bonds. Alternatives like real estate are less liquid but tend to deliver higher returns. Their performance may stay strong even when stocks take a dip. If a customer keeps 20% of his or her net worth in Fundrise eREITs™, the other 80% could be in, say, low-cost index funds from Vanguard. But convincing potential customers, even wealthy ones, to hit that 20% target is a challenge, says Miller. “It’s really uncommon for a small investor to have 20% of their investments in real estate. We’re trying to bring a less sophisticated investor to the same level of portfolio allocation you see with a big institutional investor,” he said. Though you can invest in Fundrise through an IRA by paying a $75 annual fee to the Millennium Trust Company, it may be best to save your real estate investing for non-retirement funds. That way, you can put your retirement dollars into a mix of low-fee stocks and bonds and use a separate pot of money for investing in alternatives like real estate. Once you have an emergency fund and you’re on a solid footing with your retirement savings you can dabble in real estate investing through a company like Fundrise. Any U.S. resident over the age of 18 and with at least $500 can invest, though Fundrise's advanced plans require a minimum investment of $1,000. You can browse the Fundrise eREITs™ online. You’ll be able to see a sample of the assets included in each REIT. The site details the objective, strategy and dividend payment schedule (usually quarterly) for each eREIT™ and provides a link to the full Offering Circular for the eREIT™. The Offering Circular is where you can find details of the fees associated with each eREIT™. Any eREIT™ you invest in will have a time horizon for liquidity. For each of its investments, Fundrise will specify the number of years after which the eREIT™ will “look for opportunities to provide liquidity to its investors” – in other words, facilitate investor cash-out. This is currently around five years for its eREITs™. In the meantime, you’ll receive quarterly dividends, but you’ll have a hard time getting your initial money back before the specified term unless one of two things occurs. The first way you could get your money back would be to take advantage of the 90-day satisfaction period. If you’re not satisfied with your experience and you’re still within your first 90 days as an investor, Fundrise will buy your investment back at the original amount you paid in (subject to some limitations). The second way you could get your money back would be to redeem your shares. Each eREIT™ has a quarterly redemption plan that allows investors to request that the eREIT™ redeem some or all of their shares (subject to some limitations). You can find details of each eREIT’s™ redemption plan in the Offering Circular. The eREITs™ are on a quarterly dividend schedule, which means you have the potential to get dividends once every three months. However, you can also opt to reinvest your dividends through the Fundrise Dividend Reinvestment Program “DRIP”. You can opt in or out of the DRIP at any time by changing your account settings online. At tax time, you’ll get a 1099-DIV that details any distributions you earned from an eREIT™. Your dividends will be taxed at your regular income tax rate, not the 15% rate used for qualified dividends. If you decide to redeem your shares in an eREIT™, Fundrise will report that fact in a 1099-B. Based on the information on this form you might owe money to the IRS for the amount you received in compensation for your shares. The dividends you receive from a Fundrise eREIT™ will be non-qualified dividends. That means they’re taxed at regular income tax rates rather than at the 15% rate used for qualified dividends. The Fundrise eREITs™ are a portfolio of investments like a real estate ETF that you could get from Vanguard, Wealthfront or Betterment. But as Miller points out, Betterment and Wealthfront are repackaging Vanguard real estate ETFs, and Vanguard is what Miller calls a “wrap” on investments by real estate companies. Real estate companies gather assets in the private market, buying apartment buildings, for example. The real estate companies then take the investments public, marking up those assets so they make more money and paying a cut to an investment banker in the process. So when Vanguard or another firm buys those assets the price has been marked up. Fundrise, by contrast, offers consumers access to real estate investments they wouldn’t otherwise be able to access without paying a mark-up. Miller estimates the savings from cutting out the middleman to be around 30%. But on the face of things, the fees you’ll pay each year with Fundrise are higher than the fees you would pay for a low-cost REIT investment you made with Vanguard or Schwab. For some, the lack of liquidity could be a catch. For others, the fact that you can’t choose individual projects to invest in could be a downside. Competition: How Fundrise Stacks Up? If you ask Miller (and we did! ), Fundrise’s closest competitor is Blackstone, the mammoth private equity group that invests in real estate projects across the country. But even that comparison isn’t perfect because regular investors can’t invest with Blackstone. If a retail investor were able to invest in private equity, he or she would pay “two and 20” - a flat 2% of asset value for a management fee and 20% of any profits earned. Another potential competitor is Vanguard, which offers REIT ETFs and index funds. The expense ratio of these funds is low, but the funds are what Miller calls a “wrap” on existing securities. In other words, by the time you buy a REIT ETF many layers of intermediaries have gotten paid to package up the real estate in your ETF and take it public. Fundrise’s approach “disintermediates the public market," Miller says. Translation? There are fewer middlemen standing between the investor and the real estate investments. Bottom Line: Should You Use Fundrise? Fundrise makes real estate investing easy and delivers relatively low-cost access to products to a real estate investment experience generally reserved for accredited investors. Real estate investing is a natural choice for someone with a comfortable financial cushion who wants to diversify his or her portfolio. Ready to invest in real estate? Have a chunk of change you don’t mind tying up for a while? If you answered yes and you’re chasing higher returns in our current low-interest-rate environment, it’s worth considering. You can always do what Miller says many of the company's customers do and dip your toe in with a $500 investment. Before you start looking for an advisor, it's smart to first take a step back and consider what you want from an advisor. Are you hoping to find someone to help you save for retirement or create an estate plan? Or are you simply trying to get started with investing? Once you’ve figured that out, the search can begin. As you’re looking, note a financial advisor’s certifications, background and typical clientele. If you’re overwhelmed, a matching tool like SmartAsset’s can make it easier to find someone to work with. Simply answer some questions about your financial situation and goals and the program will match you with up to three advisors. You can then get in touch with your matches to figure out if they’re right for you. And if traditional advisor’s fees and account minimums seem too high for your budget, don’t forget about robo-advisors. 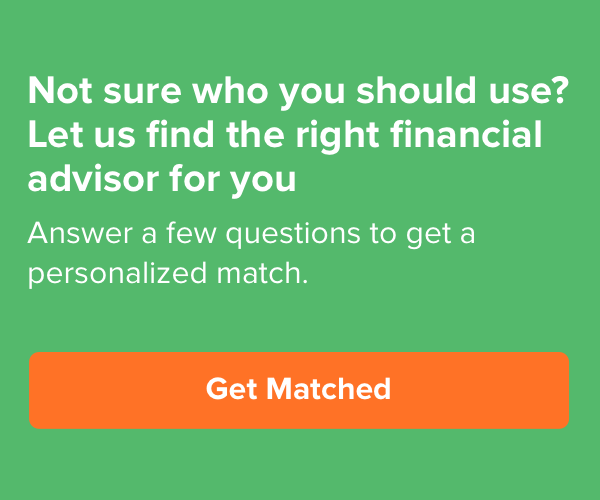 Robo-advisors digitally manage your portfolio at a much lower cost than a traditional advisor.